There are both pros and cons to RVing with a boat. On the plus side, you can experience the water by your campground in a whole new way and get out fishing or simply cruising at sunset. You can also reach boat-in only campgrounds that are more private and secluded. You can shop for various types and brands of boats at local boat shows and get a great deal with their competitive low event prices. The shows also have boating accessories that you may want to pick up as well. Check out OfficialBoatShows.com for more information on the events coming up this year. What do you plan on towing and launching your new boat with? It’s easier to back down a tight boat ramp with a truck and boat trailer or smaller Class B or Class C RV than a big Class A motorhome. Some boat ramps are so narrow that a 40-foot coach would be impossible to launch your boat with. 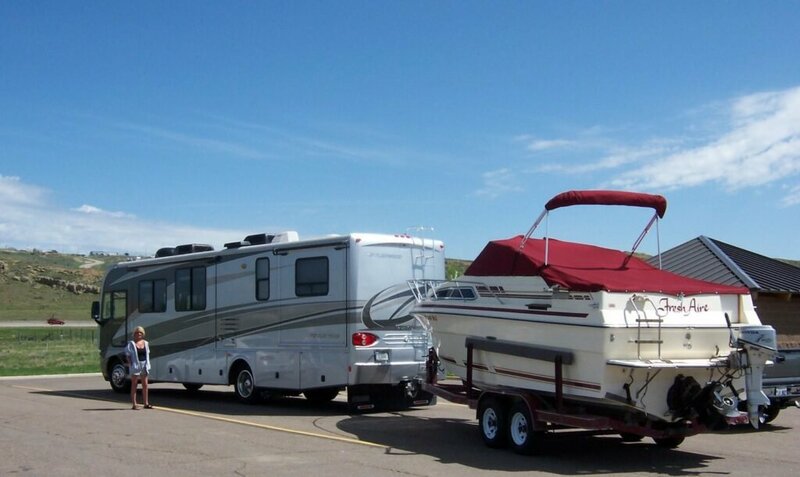 If you usually bring a travel trailer or tow vehicle along, how will you tow them with your boat? Keep in mind that triple towing is not legal in every state and may put you over the legal combined length. There are many costs that come with the initial big expense of the boat itself; this includes the annual premium for insurance, high repair bills, fuel, and marina rates. There are also several boating accessories available, some of which are more essential than others. How much your insurance rates will be mainly depends on the value and type of boat. It can make a big difference between insuring a smaller jet boat as compared to a large yacht. Typically, boat insurance rates range about $300-500 a year to fully insure, but some bigger more expensive vessels can cost much more. You’ll already be spending a ton on your boat and it is worth your time and money to keep it in good condition. Like regular upkeep on your RV, it is not only important for cosmetic purposes but also to help prevent problems while you’re sailing. You will want to regularly wash, wax, and polish your boat, fuel it up, change its oil, inspect your engine, electrical systems, and steering. This maintenance list from Sport Fishing Magazine will give you a good idea of the checklist you will want to follow. When your boat is not in use, where will you store it? Unlike cars and RVs where you can park almost anywhere, your boat will need a dock or slip for storage. After the summer boating season ends, you will also want to properly winterize your boat and have a place to store it until next year. Some marinas have year-round slips available, but you may not want to leave your boat out on the water over the winter. You can also store your boat in a dry climate-controlled boat storage facility, but you will need to consider the cost of that as well. There are many other ways to get out on the water without towing around an expensive boat. You can usually rent a boat for the afternoon from the local marina; this can be a very cost-effective way to enjoy boating without having to pay regularly on insurance, fuel, and repairs. Inflatable boats and kayaks are another popular option as they hardly take up any space or weight when not in use. The Scout Inflatable Boat can inflate up to 12 feet long and 3.5 feet wide, making an ideal boat for fishing, and it can deflate small enough to fit in a car trunk. SailBlogs – With a free account, you can share your sailing adventures through your own blog and photo galleries. CruisersForum – As a member, you can interact with others on the forums, view the classifieds for available boats or crew positions, get up-to-date information on navigation, and keep up with the latest innovations from boat builders. TrawlerForum – This site has information and discussions specifically relating to Trawler Boats, including Commercial Trawlers, Converts, and Recreational Trawlers. You can get help with maintenance questions, browse their classifieds, or discuss a wide range of topics with other Trawler owners and enthusiasts. RIBnet– Information and discussions on Rigid Inflatable Boats and Soft Inflatable Boats. You can view the photo galleries or the classifieds. BoatMad – Any boater or person interested in boating can find useful tips on BoatMad. The online community has forum discussions, photo galleries, recommendations, and more. Maxum Owners Club – An online community of enthusiasts of the Maxum brand. Members share information on the boats (which are no longer made) and boating life in general. World Cruising Wiki – You can search this site for free, up-to-date information on cruising around the world. Towing a boat behind your rig is a great way to go. Sometimes we tow our Rinker 232 Captiva Cuddy behind our Winnebago Sightseer. My wife follows in the Expedition- which is what we use to launch the boat with. RV and boat…best combo ever!